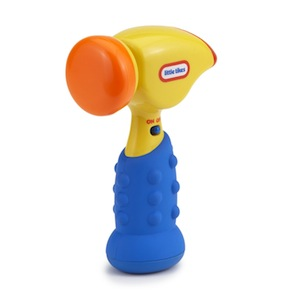 Newly styled electronic hammer features stimulating lights and sounds. Tap or shake to activate 8 delightful sounds. Soft rubber makes a great teether and the textured grip is just right for little hands as they explore cause and effect. Ages 6-36 months. DEMO batteries included. Replace with 2 "AA" batteries (not included).